LITTLE ROCK — The Bryant Blue Lady Hornets eighth grade team of Bethel Middle School rolled[more] to a 21-3 halftime lead on their way to notching their first win of the season, 32-14, over Little Rock Episcopal’s Lady Wildcats Monday night. 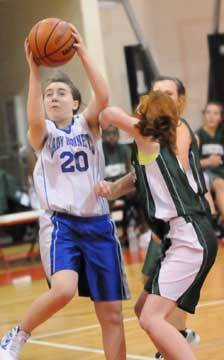 With the win, the Lady Hornets advance in the winners bracket of the Panther Pride Classic at The Anthony School. They’ll play the rival Bryant White Lady Hornets on Wednesday at 7:30 p.m.
Jordan McKnight led the scoring for Bethel with 10 points to go with four rebounds. 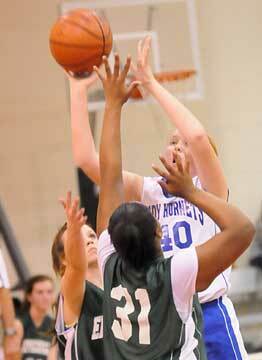 Ashlan Taylor added 5 points, Anna Turpin 4 and Anna Lowery 3. Britney Sahlman, Peyton Ramsey, Annie Patton, Rachael Miller and Elizabeth Taylor scored 2 each. 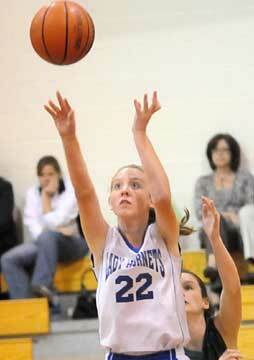 Sahlman led a strong performance on the boards for the Lady Hornets with eight rebounds. Turpin had seven and Patton four. Bryant built a 9-3 lead by the end of the first quarter then shutout the Lady Wildcats in the second period, producing the large halftime advantage. It was 27-11 going into the fourth quarter.